The National League of the Blind was an official trade union for blind workers who worked in a variety of different industries, as well as representing the interests of those who were unable to work. They were affiliated to the Trades Union Congress (and to the Scottish Trades Union Congress). What the League wanted was independence from voluntary charity and the poor relief system: they felt that the State should take direct responsibility for promoting and ensuring blind welfare. Several different bills to aid the blind had been in the works since the early years of the 20th century, none of which were passed successfully. The government set up a special committee to review blind welfare in June 1914, immediately before the outbreak of the First World War. While the committee postponed its work in the first year of war, it met again in 1915 and subsequently released a report listing recommendations on how to improve the economic position of blind persons in 1917. Legislation supported by the National League and other blind organisations – the Blind (Education, Employment and Maintenance) Bill – was introduced to make these improvements, but was repeatedly postponed and ultimately rejected, due to cost. The government drafted its own version of legislation – the Bill to Promote the Welfare of Blind Persons – which the League and others felt lacked the scope of the earlier proposed bill. First and foremost, their criticism was that the government’s bill was permissive, that is, it left much to the interpretation of local authorities. The government’s bill was to be read out on 26 April and the League organised the massive march to coincide with its reading. Setting out on 5 April (Easter Monday), the marchers hailed from all over the UK and walked different routes to maximise their presence in communities across the country. Those from the northwest and Ireland met at Manchester and marched via Stafford, Wolverhampton, and Birmingham. There they met the southwest contingent, who had started at Newport, travelling via Abergavenny and Worcester. From Birmingham, the united northwest and southwest groups travelled to Leicester to meet the marchers from Scotland and the northeast, who had marched via Sheffield and Nottingham. They proceeded towards London, meeting London-based marchers at Watford, eventually arriving at Trafalgar Square on Sunday, 25 April. Despite objections from a number of blind organisations, the Blind Persons Act was passed in September 1920 and blind welfare activists spent years afterwards trying to secure important amendments to it. Throughout the rest of this year Disability History Scotland will be leading a project to uncover more information about the Scottish participants in the 1920 march. While some historical records of the National League of the Blind are held by the Working Class Movement Library at Warwick University (including a photograph of marchers), many more were destroyed during the Second World War. We are looking for citizen researchers to look for information elsewhere, including reports of the march in the Scottish popular press of the time, as well as thinking about creative new ways to present this important moment in history. If you’d like to get involved, please email justicenotcharity@disabilityhistoryscotland.co.uk. Collections of the National League of the Blind and Disabled, held by the Working Class Movement Library, Warwick University Modern Records Centre. Lyons, C.K. 1973. The Development of Social Legislation for Blind or Deaf Persons in England 1834-1939. Unpublished doctoral thesis, University of Brunel. Reiss, M. 2005. 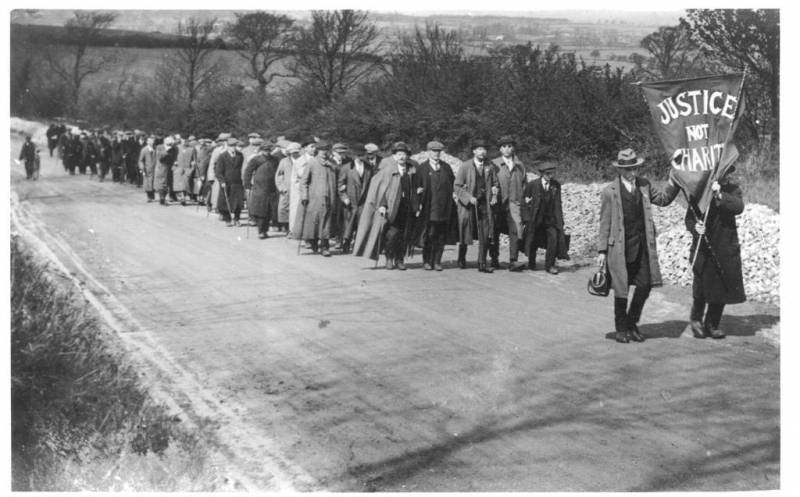 Forgotten Pioneers of The National Protest March: The National League of The Blind’s Marches to London, 1920 & 1936. Labour History Review, 70.2, pp. 133-65.